DOVER, DE - The Muscle Movement Fnd. is saddened by the recent loss of Wesley College Athletic Director and Head Football Coach, Mike Drass. During his 25 year tenure for Wesley College Football Program, Coach Drass earned a 229-69-1 record, which included six NCAA tournament semifinal appearances, 14 NCAA tournaments, three consecutive years empowering a local Muscle Movement Fnd. Muscle Champion, and touching the lives of thousands of students, athletes, colleagues, and families. Coach Mike Drass welcomes Muscle Movement Fnd. Muscle Champion, Eddie Hazeldine and his sister, Sara, at Drass Field! From 2015-2017, Coach Drass took initiative in working directly with Muscle Movement Fnd. Founder/President and Delaware native, Rob DeMasi. Coach Drass supported DeMasi's personal diagnosis of myasthenia gravis (MG) and mission to empower his fellow "Muscle Champions" - individuals living and overcoming the debilitating effects of muscle disease - throughout the state of Delaware. Each year Coach Drass welcomed Muscle Movement Fnd. Muscle Champion, Eddie Hazeldine. In 2015, Eddie was a 12 year old boy living and overcoming the debilitating-effects of duchenne muscular dystrophy (DMD); a genetic disease that causes muscle degeneration and weakness throughout the body. During 2015, Eddie utilized a walking-aid to maintain his mobility. Despite the progression of the disease, which eventually took away Eddie's ability to walk, Eddie woke up every day with a smile on his face and continued to walk as much as possible! After Coach Drass heard about Eddie's story, he was inspired and determined to create a life-changing experience for Eddie and family and was honored to have Eddie meet his team. 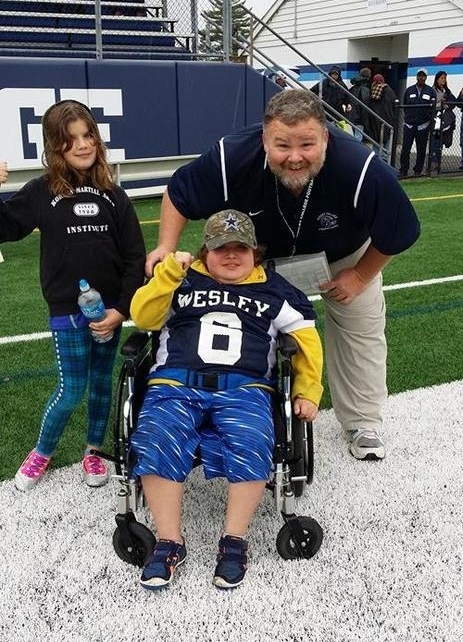 By way of the Muscle Movement Fnd., Eddie Hazeldine became Wesley College's honorary football captain during 2015. Before the start of the 2016 season, Coach Drass contacted Rob DeMasi requesting for Muscle Champion, Eddie Hazeldine, to be added to his team roster once again. The relationship was magical. Coach Drass presented Eddie his very own Wesley Football jersey and each year welcomed Eddie with the utmost compassion. Coach Mike Drass gives Eddie a pre-coin toss talk before a Fall 2017 home football game!